In Auto and Auto Flash Off modes, the camera may shift to the Portrait, Landscape, or Close Up Scene mode if it thinks one of those modes will do a better job of capturing your subject. The Exposure mode icon in the top right corner of the display indicates which mode the camera selected for you. Enable Live View by rotating the Live View switch and releasing it. In Live View mode, picture settings appear over the live preview rather than on the Shooting Information screen. Which settings you can access depends on your exposure mode. If you don’t see the same type of data on your monitor, press the Info button to cycle through the possible Live View display modes. 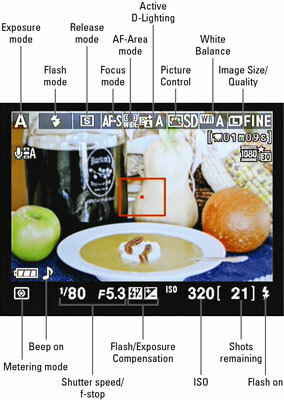 Some settings, such as Exposure Compensation and Flash Compensation, appear only when those features are enabled. If you enable automatic bracketing, you also see bracketing indicators above the shots remaining value. When AE Lock (autoexposure lock) is engaged, an AE-L symbol appears to the right of the Metering mode symbol. And about that Metering mode symbol: Although the camera lets you change that setting, it always meters using the Matrix setting anyway. For some settings, the impact of your selected option is visible in the monitor. Change the White Balance setting, for example, and you can see colors shift in the live preview. But Exposure Compensation adjustments aren’t always reflected by the monitor brightness. When you increase or decrease exposure using this feature, the image on the monitor becomes brighter or darker only up to shifts of EV +/-3.0, even though you can select values as high as +5.0 and as low as -5.0. Regardless of the Autofocus mode, exposure metering begins when you adjust the shutter button halfway and is adjusted until you take the picture.